There is no doubt that politicians are on the fore-front of every major news provider right now. With the Iowa Caucus and New Hampshire Primary behind us and Super Tuesday right around the corner, things are really heating up on the campaign trail! I'm not sure about you all, though, but I'm ready to step back from all the craziness and just take a deep breath! So how about this, have you ever thought about how the President utilizes technology? It's pretty cool to remind yourself that the President is just like us in terms of enjoying (and learning how to use) 21st-century technology. The following post will take a look at some of the ways the President has used technology in his personal life. 1. BlackBerry: As recent as 2013, it had been reported among multiple sources that President Obama was still using the seemingly declining BlackBerry. The reason? Security. BlackBerry has been widely known as having the most security control and for containing more than 70 security certificates, which is more than any other mobile device provider. It's hard to blame him for continuing to use a BlackBerry then, right? 2. iPhone: Just because he has remained steadfast on using a BlackBerry has his primary mobile device, it doesn't mean that he has any reservations about using Apple products. While it is still believed that he does not own his very own iPhone, in 2015 it was made public that he borrowed someone else's iPhone to send out his first ever personal tweet1. President Obama has broken down many barriers since taking office in 2008. Most notably, being the first African-American president in the White House. However, he is now the first active President with a Twitter account. Add another one to the record books! 3. iPad: There is also no shortage of iPad usage and familiarity by the First family. In 2010, President Obama made all sorts of technology history by being the first Commander-in-chief to autograph someone's iPad. For his own personal use, it's been widely noted that he spends hours using his personal iPad. Between surfing the internet and staying up-to-date on all the latest sports news, it is no secret how much the President enjoys his iPad! 4. 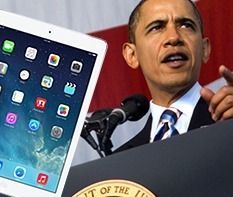 Tablets: When it comes down to business for the President, tablets seem to be the popular choice. He has been noted and pictured on multiple occasions utilizing tablets for daily briefing and meetings2. It's always a good reminder that even the leader of the free world enjoys dabbling in modern technology; and undoubtedly has his growing pains with learning how to use it much like us - the struggle is real. What can be a legitimate struggle, though, is keeping your mobile devices protected. The wear and tear of your daily routine can lend to some unpleasant device damages. If you are uninsured, these damages can become extremely costly. So why not get protection for your mobile devices? Browse our product insurance options and find a plan that works best for you!